This week’s work of art is by a Russian artist, Jean Béraud, though he lived much of his life in France during the Belle Epoque. 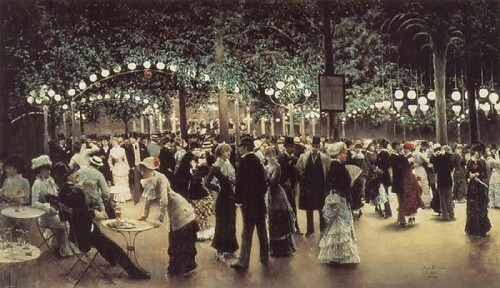 Open-air Ball, or Le Bal public, was painted in 1880. Depicting a typical scene of Paris night life in the 1880s, speculation has the setting being the Closerie des Lilas cafe. 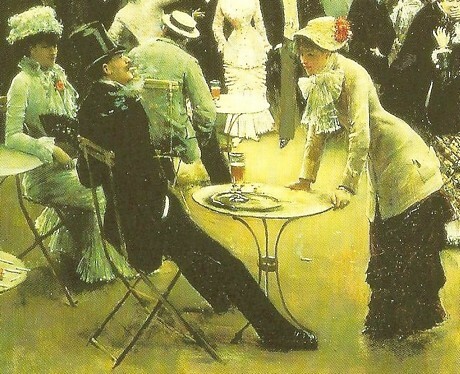 People are dancing on the right-hand portion of the painting, but resting with glasses of beer on the left, as shown in a detail of the artwork below. You can read Béraud’s biography at Wikipedia, and also at the Tate. You can see more of Béraud’s paintings at All Posters and Hoocher. That’s a beautiful painting – great depth. Love the way the beer is rendered, too.